Product information "Nanodisc Assembly Kit MSP1D1 dH5-His_DMPC"
Nanodisc assembly kit to prepare empty nanodiscs e.g. for assembly of nascent proteins in cell-free expression reactions. 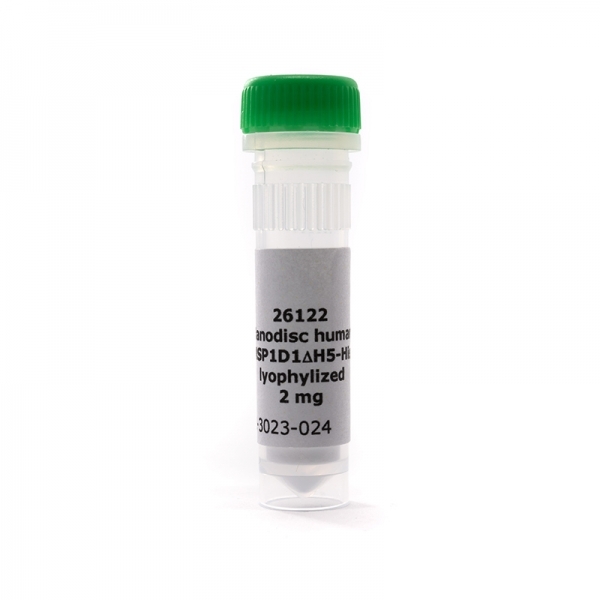 Kit contents: 2 mg lyophilized Membrane scaffold protein 1 D1 delta H5 mutant, N-terminal 6xHis-tagged, 4.87 mg dimyristoyl-glycero-phosphocholine (DMPC), 20 mg sodium cholate. Content of kit yields about 50 microliter nanodisc suspension in a concentration of ca. 10 mg/ml. Related links to "Nanodisc Assembly Kit MSP1D1 dH5-His_DMPC"